He's been honored as "Knight of Tahiti Nui" and received Japan's Order of the Rising Sun. A new species of extinct bird in the Marquesas Islands also bears his name. Still, Yosihiko Sinoto, world-renowned anthropologist at the Bishop Museum, was surprised to receive another honor recently during a monthly museum staff meeting. Sir Yosihiko Sinoto, a rare hibiscus hybrid plant, was created and named for him by Jill Coryell of Mokuleia, known as The Hibiscus Lady. "I never expected the hibiscus," said the pre-eminent Hawaiian and Pacific anthropologist. He said a blooming hybrid plant was given to him to take home and three small plants were planted in a ceremony near the flagpoles at the museum's entrance. The flowers are red with a purple rim and light purple color in the center, he said. 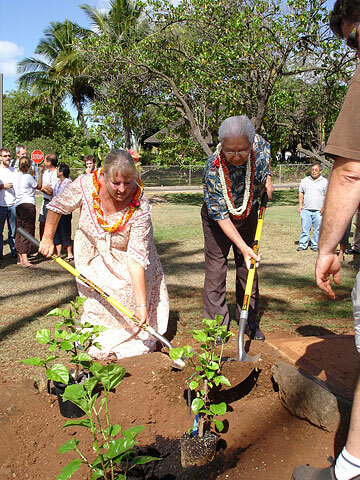 The plant was registered with the American Hibiscus Society and presented at the ceremony by Coryell and Mary Lou Foley and Roy Cordeiro of Outrigger Hotels, which helped to sponsor the hybridization project. Coryell has created more than 7,000 types of hibiscus of different colors in the past seven years. Michael T. Chinaka, interim museum president, Wayne Sterling, chairman of the Bishop Museum Association Council, and museum staff members and supporters attended the planting ceremony. Tommy Boyd, the museum's garden caretaker, helped to prepare the garden for the Sinoto hibiscus. Sinoto holds the Kenneth Pike Emory Distinguished Chair in Anthropology at the Bishop Museum. He has worked 40 years on the island of Huahine near Tahiti, trying to restore and preserve the prehistoric village of Maeva, abandoned marae (temples) of French Polynesia and other prehistoric remains. He began exploring Tahiti in 1960 with Emory and has since explored and excavated in the Society Islands, Marquesas, Tuamotus and others, studying ancient settlements, artifacts, migration patterns and Polynesian cultural ties. He discovered the preserved remnants of an ancient deep-sea voyaging canoe in 1977. Author Rick Carroll wrote a nonfiction mystery about Sinoto and the unearthed canoe in the book "Huahine, Island of the Lost Canoe." Sinoto said it was through his excavations in the Marquesas that the extinct bird, a new species, was discovered and named for him. He is working part time now at the museum but is continuing his mission to preserve Huahine Island. "I have to maintain those things that I have done," he said. Hibiscus love regular watering, good drainage and regular pruning. The plants don't need fertilizer to grow but do better if fed with a water-soluble nitrogen-phosphorous-potassium (2-1-3) fertilizer once a month. They also do better if some Epsom salts are sprinkled around the base of the plants without touching the trunk, then watered. Hibiscus also like fish emulsion. To keep pests at bay, sprinkle the undersides of the leaves each week with a hard spray of water to shake off bugs and their eggs.